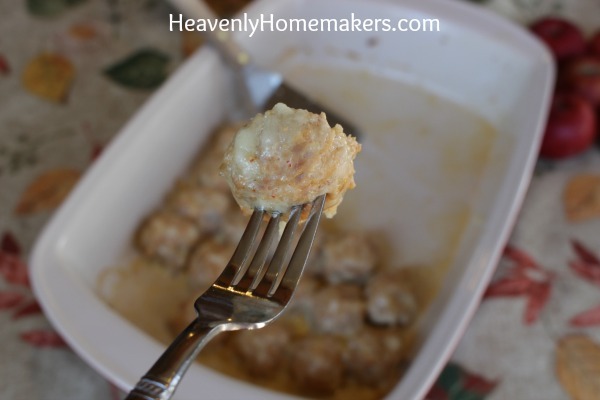 I experimented with these Chicken Cheeseballs on a whim. It was a simple recipe and I figured chicken and cheese – sure, they’ll probably be pretty good. Pretty good? I should say so! I turned right around (did the hokey-pokey) and made these again three days later. 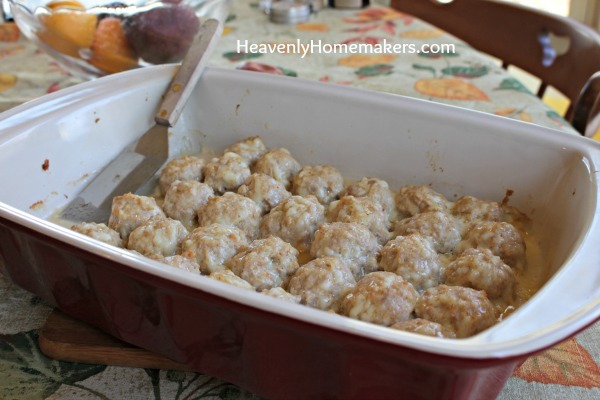 These cheesy little meatballs are incredible! The first night I pulled a batch of these out of the oven, one by one my men came into the kitchen, took a look at the meatballs, and popped one into his mouth. I think each one, in turn, said the same thing, “Whoa. What are these? These are amazing! You can make these again!” (Don’t mind if I do.) I wouldn’t say my family is very picky, and yet, when every single person in the family likes a recipe, this is a huge score. You might be wondering, like I did, “What holds these meatballs together? Don’t we need flour or bread crumbs or a bisquik type baking mix to make this recipe work? Nope. They stay together just fine even though they are made with only ground meat, cheese, and a few spices. They take only a few minutes to mix up and scoop into a pan. You can make the side dishes for your meal while they bake. AND, if you have time, you can make a double or triple batch to freeze so that all you have to do at mealtime is grab out the amount you need and bake them! I used a scoop like this one to make these meatballs. Whoa, does that little kitchen gadget come in handy! Scoop mixture into a 9x13 inch baking dish. Bake in a 350 degree oven for 20-25 minutes or until balls are nice and brown. Pour off excess grease that has accumulated before serving. Use ground sausage or ground beef if you prefer in this recipe. 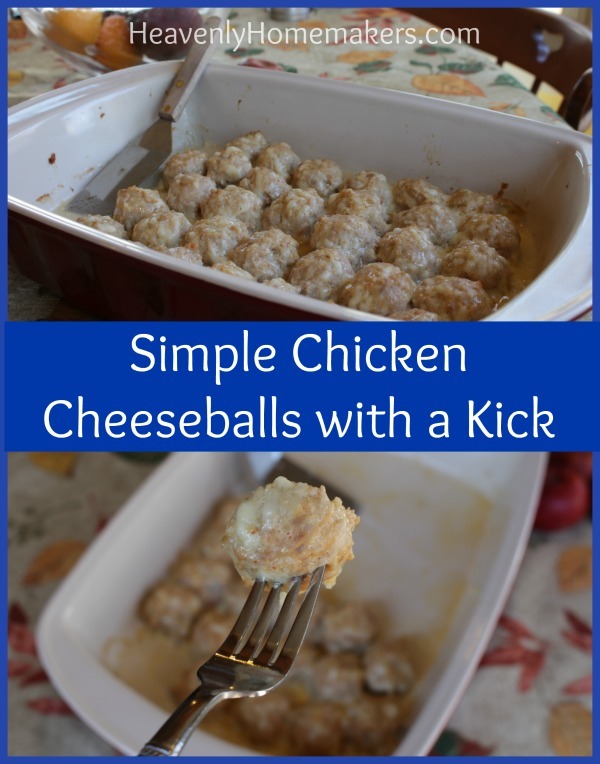 You can use these Chicken Cheeseballs on a holiday snack buffet table, serve them for breakfast, or serve them as a main dish at dinner – they are perfectly versatile. I’m looking forward to keeping these in my freezer for quick, simple meals in the future! Simple Meals is where it’s at. Let us do your planning for you, and don’t worry, we’ll keep it simple! Maybe a silly question, but where do you get your ground chicken? Do you have a kitchen gadget for grinding your own raw breasts/thighs to use? That’s not an item I have searched for in the poultry section. If I already have my chicken cooked can I ground it and continue the same way or does it need to be raw for it all to stick together. Do you freeze them cooked or raw? And what is the reheat time when frozen or do you thaw first? Thanks! These sound really yummy. Are they very spicy from the hot sauce? My kids don’t like spicy food so wondering how spicy they are and if it would be ok to leave hot sauce out? Thanks for sharing your recipes. These are only mildly spicy, but you can definitely leave the hot sauce out if your family would prefer! I’m adding ground chicken to my grocery list, so I can make this recipe soon. I think it will be a “keeper”! I know this is probably an older post; but do you use pre-shredded cheese or shred it fresh? Thanks Laura just bought the fixins. On my way to feed 5 dudes.